Gain tactical advice, examine ship blueprints and go behind-the-scenes of this sci-fi adventure. Lots of people write unofficial guides to video games, and for the most part, you stand to gain valuable tips from these passionate fans, but it's always a good idea to get info straight from the source. That said, the developers at Fishlabs partnered with Steel Media to bring the Galaxy on Fire 2 Pocket Gamer Guide to iPhone and iPad. With this virtual download, you'll receive the full breakdown for the entire game, including expansions Valkyrie and Supernova. You can listen to exclusive interviews, drool over ship schematics and learn tips of the trade. -Make the right choice with our comprehensive profiles of all of the weapons available in the GOF2 universe. -Get to know the complete GOF2 fleet with our rundown of the complete set of official stats and info. -Be on first-name terms with the games' vast range of equipment and plan your upgrade path according to your play preferences. -Maximize your profits by learning where to buy and where to sell every commodity with our handy taptastic breakdown. 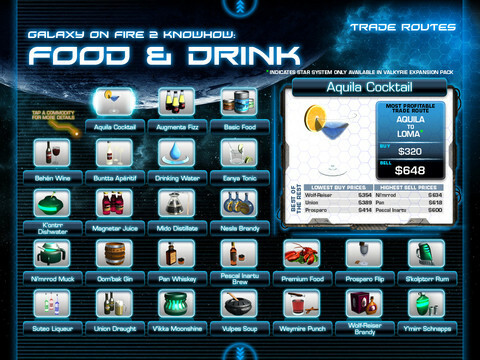 -All of the GOF2 Blueprints exposed: know their location, learn the recipes, enjoy your creations. -Tour the GOF2 universe and its Jumpgate network with our intergalactic sat-nav.